Iridium prepaid voucher with different possible credits. The units on this prepaid voucher will be charged on your Iridium SIM-card. Choose between 75 - 200 - 500 units, or a 30 day time extension. Iridium prepaid voucher with different values to meet your needs. This voucher will be loaded on your Iridium SIM-card, and can be used with the Iridium 9555 or Iridium Extreme 9575 satellite phone or with the Iridium GO!. Remark: each Iridium prepaid voucher has a differnet validity! The validity of your Iridium Prepaid Voucher starts from the date of activation or top up, the time extension starts at the planned end date of your previous voucher. 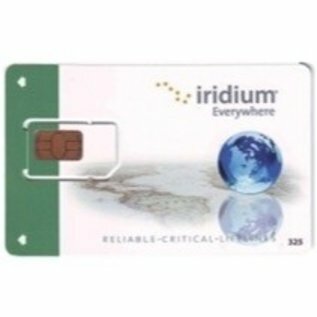 All Iridium prepaid SIM-cards enjoy a 90 days grace period. To avoid deactivation and to keep your telephone number, you will need to top up your SIM-card within this period. If you want to keep on using your current SIM and telephone number after the these 90 days, Iridium will charge you a reactivation cost of 228,20 USD. To make sure that your remaining balance will rollover onto your new Iridium Prepaid Voucher, you must buy and activate a new voucher at least 24 hours prior to the expiry date. The cool down period of 14 days, within which you can send back the purchased product, is explicitly NOT applicable on this Iridium Prepaid Voucher, because we activate it immediately upon receipt of your payment. You can however apply for a 14-day-cool-down period yourself, if you send an e-mail to astron@astron.be with your order number and your request to schedule the activation at least 14 days later (or on a specific date).